To a newcomer unfamiliar with traditional Pennsylvania Dutch food, the dishes may sound a little unusual, to say the least. They often have odd-sounding names derived from their German background. However, you'd be surprised by how delicious they taste. As part of the region's tradition to avoid waste whenever possible, Pennsylvania Dutch food tends to incorporate parts of animals that most people would not even imagine consuming. Most meals incorporate the fresh produce which is found in such abundance in the region and consist of simple ingredients that are not heavily processed. Unfortunately, though, as good and rich as it may taste, a lot of Pennsylvania Dutch food is not very healthy. The heavy use of butter, starch, and fatty meat inevitably produces meals that are high in cholesterol and saturated fat. Having said that, the average traditional meal is satisfying and will certainly fill you up. Also, Pennsylvania Dutch food is usually quite economical considering how large most portions are. So, if you are health conscious, keep in mind that there is nothing wrong with eating in moderation. If you feel adventurous and want to experience the full Lancaster County experience, go ahead and sample some of the more unusual Pennsylvania Dutch food specialties that are available. This personal favorite of mine is actually more of a concentrated apple sauce than a variety of butter. Apple Butter gets its name from its thick consistency and well as the fact that it is often used as a condiment in lieu of butter. For instance, apple butter is delicious simply spread on bread. It is produced by the slow cooking of apples with cider or water until the sugar in the apples caramelize. Often, spices such as cinnamon and cloves are added for additional flavor. Apple fritters are slices of apple which are breaded and deep fried in oil. This is a mixture of different vegetables such as cabbage, carrots, beans, cauliflower, asparagus, and peas. The combination is pickled in a jar and served cold. The name is derived from the French word "chou" which means cabbage. These are actually hard-boiled eggs that are pickled with whole beets in a mixture of vinegar and sugar. They reach their peak flavor after being chilled for two to seven days. The eggs turn a pinkish color from the process. This item refers to finely cut dried apples, ham, and dumplings. This is a dish of tiny noodles or dumplings made with flour, eggs, water or milk, salt and sometimes nutmeg. The spaetzle dough is rolled and cut into slivers which are usually boiled (poached) before being tossed with butter and grated cheese or added to soups and other dishes. Spaetzle is served as a side dish much like potatoes or rice. It is often served with meat and accompanied by a sauce or gravy. The cooked spaetzle can also be pan-fried with a little butter and onions. Apple dumplings are a popular Amish food usually served at breakfast. Peeled and cored apples are filled with cinnamon and sugar and then wrapped in dough. The dumpling is then baked until tender. In keeping with the Pennsylvania Dutch tradition that nothing should go to waste, if possible, is pretty much how scrapple originated. Because there is usually small scraps of meat left over after butchering, the Pennsylvania Dutch decided to transform these "scraps" into a meal instead of simply throwing them away. Scrapple is a loaf-like patty which is a combination of cornmeal and buckwheat flour simmered with pork scraps and trimmings. Spoiler Alert: To warn the squeamish, this includes scraps from the heart, liver, head, and other interesting parts of the pig. However, these ingredients aren't that much different from what can be found in a good old-fashioned American hot dog. The meat is seasoned with sage and thyme and other spices, depending upon the individual preference of the chef, as well as the traditions of the region where it is being prepared. It is then cut into slices and pan-fried until an outside crust is formed. Scrapple is usually served at breakfast alongside eggs, and eaten with apple butter, ketchup, or syrup. This Pennsylvania Dutch food specialty is a stew, usually comprised of a combination of chicken, ham, beef, or wild game with home-made, square-cut egg noodles, potatoes, and a stock of onion, celery and/or carrots, and parsley. Bouillon is sometimes used to enhance the flavor. Also, baking powder may be used to add thickness. This is dish where beef is spiced with onion, bay leaf, cloves, vinegar, salt and pepper. After sitting for 24 hours, the meat is browned on both sides and boiled for 2 hours. It is then thickened with brown flour to make a gravy. A beef fillet is seasoned with onion, parsley, salt and pepper. The fillet is covered with chopped meat, and rolled and tied. It is then cooked in a covered pot with one cup of water until tender. It is often served with gravy. A traditional dish where rabbit meat is placed in a container and covered with vinegar and equal amounts of water. It is then seasoned with onions and other ingredients. It remains marinated for 2 days. The meat is then browned in a frying pan in butter and some of the juice from the container. The meat then simmers for 30 minutes and served with Dutch sour cream. This is where a pig's stomach is stuffed with cubed potatoes, sausage, cabbage, onions, and spices. It is traditionally boiled in a large pot filled with water. It can also be baked or broiled. Hog Maw is usually cut into slices and served either hot on a platter or cold as a sandwich. This dish is especially popular in the wintertime in Pennsylvania Dutch Country. Beef liver is seasoned and diced with salt, pepper, celery, parsley, and onions before being fried in butter. The meat is shaped into balls about 2 inches in diameter and wrapped inside the prepared dough to form the dumpling. The dumpling is then boiled in soup stock for about 20 minutes. This is a dish in which pig's feet are boiled until the meat falls from the bones. The meat is then seasoned with salt, pepper, and vinegar to taste. It is then put into a mold before being served. This is a doughnut-like treat. Potato dough is deep fried and then coated in powdered or granular sugar. They are sometimes filled with fruit jam. Fasnachts tend to be either square-shaped (to represent the four gospels of the bible) or triangular-shaped (to represent the Trinity). Traditionally, Fasnachts are a Pennsylvania Dutch food dish eaten one day before Ash Wednesday since many people give up sweets for Lent. In fact, in Lancaster County, Shrove Tuesday, the day before Ash Wednesday, is known as Fasnacht Day. This sweet desert is a traditional favorite among the Pennsylvania Dutch as well as many visitors to the Lancaster County. This pie consists mainly of molasses, brown sugar, water,and butter. There are two common varieties. 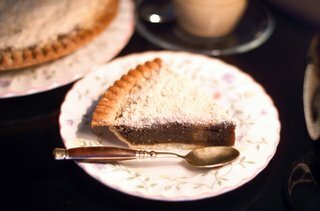 The first is the "wet-bottom" shoofly pie which consists of a layer of moist, gooey molasses beneath a crumb-like topping. On the other hand, the "dry bottom" shoofly pie is where the molasses is thoroughly mixed into the crumbs into a cake-like consistency. The name is commonly believed to come from the fact that the sweetness is so attractive to flies that they have to be constantly "shooed" away. 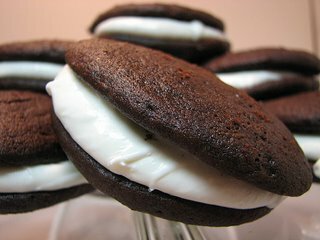 This is a baked good consisting of two small chocolate, disk-shaped, cookie-like cakes with a sweet, butter cream, whipped cream or marshmallow frosting sandwiched between them. Although this is a traditional Pennsylvania Dutch dessert and snack, many people believe that it first became common in the New England region after being introduced by migrating Amish sects. The name is thought to derive from the emotion that is provoked after one tastes the sweet, creamy confection.